Red House. Any guesses on how it got its name? Image by M@. The National Trust has lined up an epic London adventure with more ingredients than a pick 'n' mix sandwich — but in a classy way. 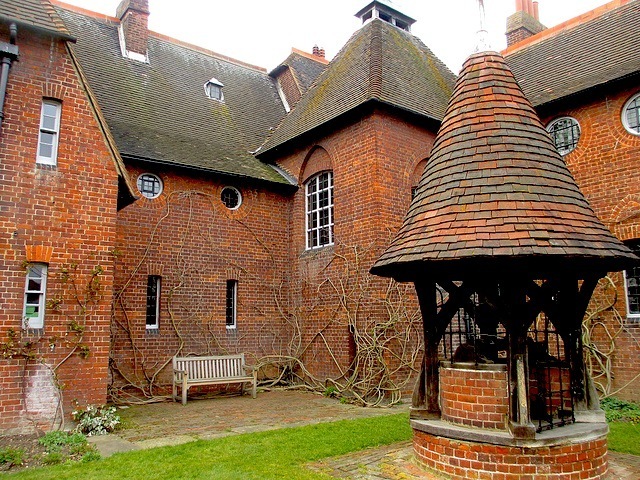 Starting at the George Inn in Southwark, you'll walk the 13 miles to Red House, Bexleyheath, the former home of William Morris. If the journey's too far, you can also use a special hand-drawn map to find your way by bike or public transport. The route passes through some of London's best green spaces, such as Oxleas Wood and Greenwich Park, with plenty of urban interest too. Along the way, you'll meet artists and storytellers (including Londonist friend Vanessa Woolf and the inimitable John Constable), with additional contributions from experts on a site-specific audio guide. The route also mirrors that of the Canterbury pilgrims, and you'll learn plenty about Chaucer and medieval pilgrimage. Once at Red House, relax with an after-hours garden party featuring live music, guest speakers, local ales and a hog roast. The event is devised by Henry Eliot who, when he's not leading strangers on unusual literary walking tours, is one of the brains behind the superb CurioCity mag. Throw in the association with the National Trust's London Project, and we have no hesitation in recommending that you get tickets. We guarantee it'll be the best art-and-literature-inspired-walk-through-London-with-a-hog-roast-supper you'll ever do. Pre-Raphaelite Pilgrimage, Saturday 7 September 2013, 9am-9pm, £20 (adult), £16 (concessions), £14 (children). In a final twist, any red heads (natural or non-natural, and possibly supernatural) will get a ticket concession, this being a trip to Red House and all.